I was looking for a small CCW 9MM at a local gunshop. Like I need another one:-) After some looking at various pistols I decided to take a closer look at the Taurus 709 Slim and I’m glad I did! Taurus has been very active in the last few years creating some interesting designs for just about any purpose. This little pistol is very light and points naturally when brought up to eye level. The grips are aggressive enough to provide a good grip without being abrasive in the least. All edges of the gun have been mildly rounded to prevent any snags or those annoying cuts to your hands. The sights are adjustable and have a very low profile. They use the standard three dot system. 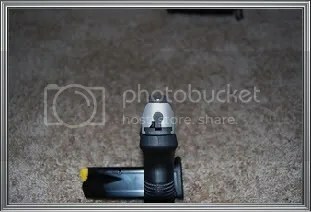 The trigger is very good especially for a stryker fired pistol. The slack is reasonably short with a crisp break. It also has the double strike feature should a round fail to fire on the first trigger pull. The center of the trigger has the usual plastic piece as a safety as well as a manual safety located in the same area as a 1911. The ejection port is completly open on the top of the slide which helps with positive ejection. The extractor is located on the outside of the slide. When a round is chambered the extractor protrudes a bit so that you can feel a round is chambered. It also has a red line on the top of the extractor. This shop has an indoor range and fortunately for me they had a rental Taurus 709. I loaded up with 100 rounds of 9MM and headed into the range. I shot groups from 7, 10 and 15 yards. The little pistol performed very well with no malfunctions of any type. The group at 7 yards averaged just inder 2 inches with those at the 10 yard line ran 2 1/3 inches. From 15 yards the groups opened up to 3 inches. 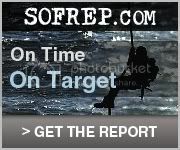 This is good combat accuracy and would be very suitable for concealed carry defensive situations. The grip feels good with a size that is not to small for normal size hands but not to large for small hands.Taurus did their homework on this design. I dropped this pistol in my front jeans pocket and it disappeared and would never be noticed if you choose to carry that way. I would counsel using a holster however. Takedown is simple in fact very much like a Glock. 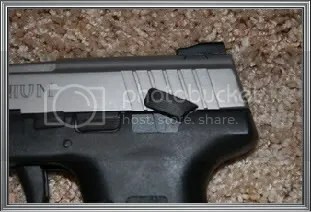 There are two plastic pieces just above the trigger guard that are pulled down at the same time. You simply pull the slide off. Note that the pistol must not be cocked to do this. That’s all there is to it. I can recommend this Taurus for CCW and would feel well armed carrying it with a spare magazine. If you have any questions or comments feel free to send them in and I will answer them as soon as I can. This Taurus is an excellent example of a very useful pocket pistol. It has undergone some changes namely the pistol is slightly larger than it’s predecessor as well as having a double stack magazine as opposed to a single stack. I like this version better since the magazine holds 12+1 rounds of 9mm and has a grip profile that accommodates a full grip without your little finger hanging underneath the magazine. The previous version has been discontinued in favor of this model. The calibers available are 9mm, 40 S&W and 45 acp. Since this is a small pistol I decided on the 9mm for the benefit of less recoil and faster follow up shots as well as the number of rounds it holds. 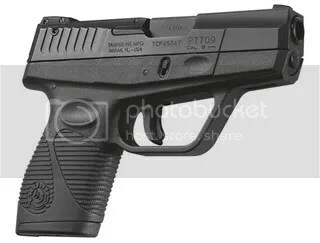 Another version of this pistol has a rail for attaching lights etc however on a pocket pistol I prefer a smooth underside so that it doesn’t snag when drawing from a holster on the belt or from an inside the front pocket holster. The grip itself is pure Taurus with the standard lateral cuts on the grip front and back to provide the user with a very secure no slip grip. The PT111 comes standard with Heinie “Straight Eight” sights which have one dot over the other for fast sight alignment. The pistol weighs 20oz which puts it in a category of lighter pistols for deep concealment. 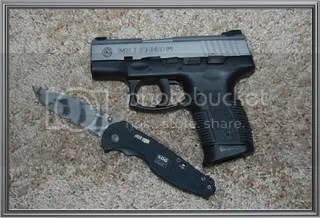 It is certainly smaller than the Glock 19. The trigger pull is approx. 3.5 pounds which doesn’t bother me since it has the manual safety. 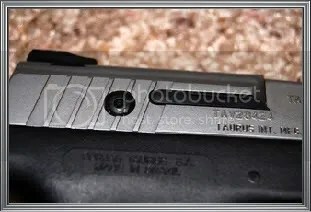 If you look at the above picture you will see the rear most control under the slide as the manual safety which operates the same as the 1911 and is very easy to manipulate(the red dot on the slide indicates the safety is off). The next control forward is the slide release with the final control being the takedown lever which rotates then pulls out allowing you to remove the slide. Another handy feature is the indentation on the frame allowing you to index your thumb when firing. The right side has the same indentation for placing your trigger finger in when not resting on the trigger. Takedown is simple. As mentioned before the forward lever is rotated then removed with the slide back and locked. Then pull the trigger all the way to the rear and the slide comes right off. One reason for the light recoil for this small gun is it has dual recoil springs on the full length guide rod. Another reason is your hand rides high on the grip bringing your hand closer to the bore axis. This gives more of a straight push back instead of the flip experienced on pistols with single spring recoil systems and a lower grip. The trigger is smooth and well rounded making it very comfortable with good feel. The barrel is 3.2 inches in length. Another advantage is the double strike capability. Should you have a misfire you simply pull the trigger again to fire the round. 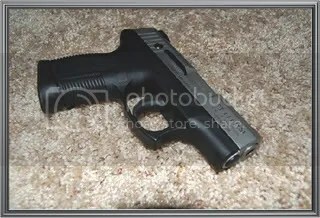 As far as I know this is the only pistol of this type that has this feature. I’ve tried carrying this pistol in my front pocket and found that it does not print at all and is comfortable carrying in this way. Don Hume also makes a holster for front pocket carry that has a small hook on the holster to keep it from being pulled out with the gun when drawing. 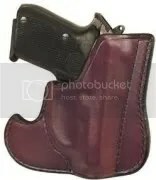 The Don Hume holster is only $32 at Gunners Alley. The extractor also serves as a loaded round indicator. Shooting the PT111. I fired a total of 200 rounds of assorted 9mm in standard loads as well as +P and had no malfunctions of any type. As I said before the recoil is surprisingly light for a gun of this size and weight. I fired from the 10 yard line as well as at 15 yards. This is really about the maximum distance for a defensive pistol of this type. At ten yards firing slowly I had groups of 2 inches at first until I got used to the trigger. After 100 or so rounds I got the groups at 10 yards to between 1 1/2 inches to just under 2 inches. At 15 yards groups were what you would expect from a defensive pistol of this size ranging from 2 to 2 1/2 inches firing a bit faster. After first using these sights on the Taurus 1911 I’ve come to really like them and the smaller size sights on this pistol work just as well. 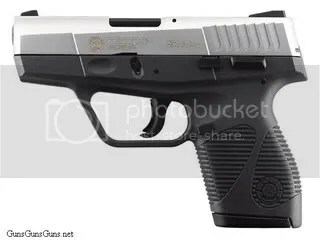 To sum things up this is a nice summer carry pistol with very good features and well thought out design. Accuracy is good for a small pistol with such a short sight radius. At just under $300 you would be hard pressed to find another pistol of this quality at such a low price. The more I shoot this little jewel the more I enjoy it. 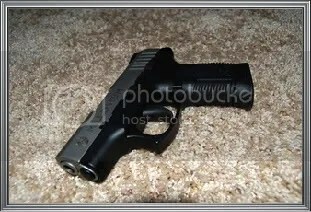 I can recommend this pistol without reservation to anyone looking for a well made pocket pistol. Whether you carry it on the belt in a pocket or a purse this Taurus is a fine choice that packs a lot of firepower into a small package using an effective defensive round!